Argh! Avast, ye hearties! Piracy is an act of robbery or criminal violence by ship- or boat-borne attackers upon another ship or a coastal area, typically with the goal of stealing cargo and other valuable items or properties. Those who engage in acts of piracy are called pirates, and their vessels are commonly known as pirate ships. The earliest documented instances of piracy were in the 14th century BC. Take your papercrafting to the next level with this Black Pirate Ship Paper Nano Model Kit, complete with Space Shuttle! 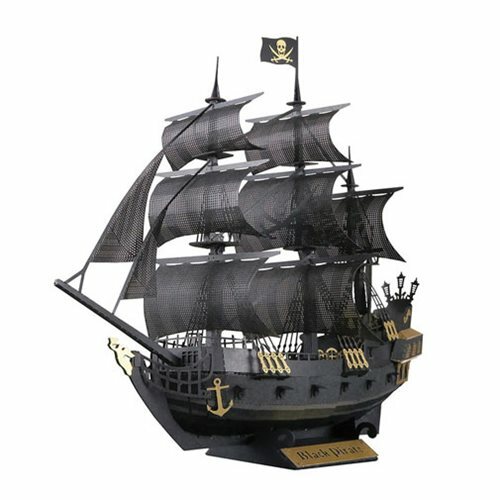 Laser-cutting technology allows you to build the world-famous vessel in more detail than ever before, and it's the perfect display piece to show off your papercrafting skills! Detailed color instructions and a folded display case included. Ages 12 and up.